The Walter Site (23HD38) is a Clovis site situated on the bluffs of the Missouri River. The site was discovered by George Nichols, an amateur archaeologist and member of the Missouri Archaeological Society. Mr. Nichols reported the site to the Archaeological Survey of Missouri and Professor Carl Chapman (UMC). The Walter Site is situated on private properety and is not open to visitors. 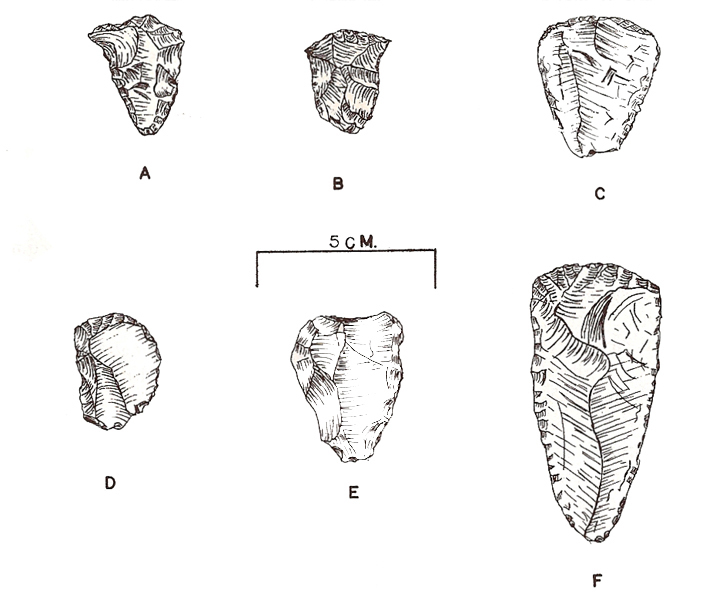 Clovis point from surface of the site. Length = 96 mm. Width = 37 mm. Thickness = 11 mm. The thickness of the point is surprising. 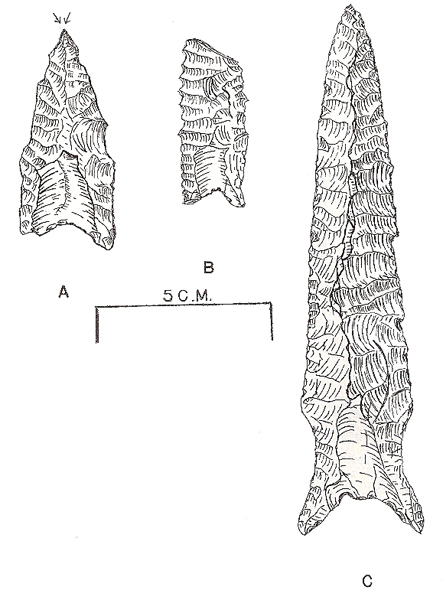 Three fluted points from the Walter Site. Two failed Clovis points with reverse hinge fractures from the Walter Site. Scrapers from the Walter Site. 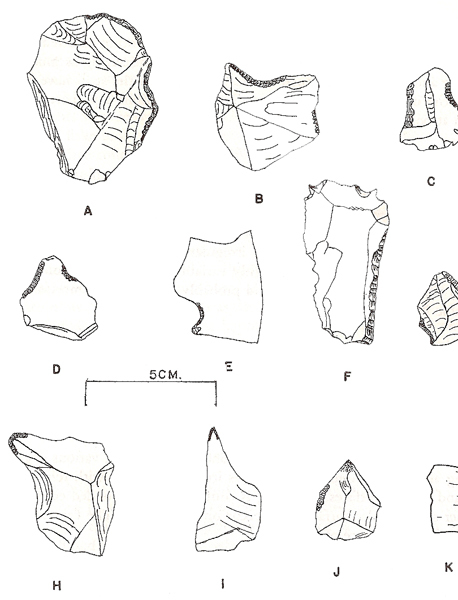 Flake tools from Walter Site. Gravers on a flake scraper from the Walter Site. 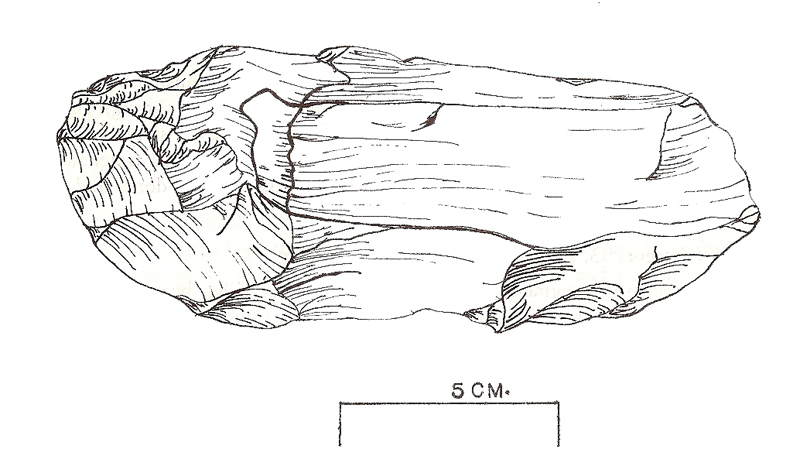 This specimen was identified as a chopping tool (Biggs et al. 1970:36-37) that was "rather crudely flaked." Another possibility is that this is a core. 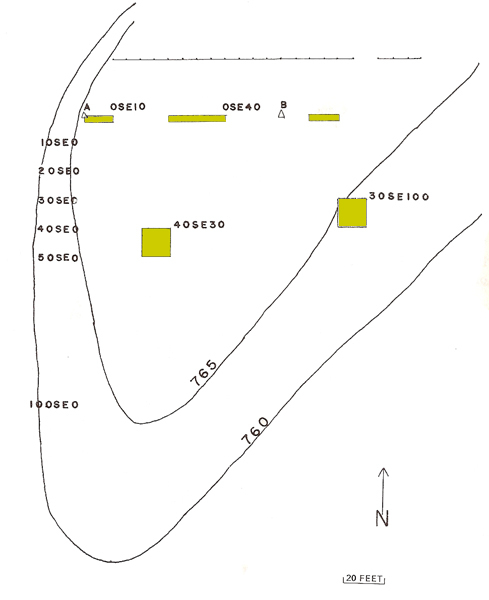 Contour map and distribution of excavation squares and test trenches at the Walter Site. The 1970 test excavation of the site by the Department of Anthropology at the University of Missouri - Columbia found a low density of material culture in the plowzone. No artifacts or features extended below the plowzone. 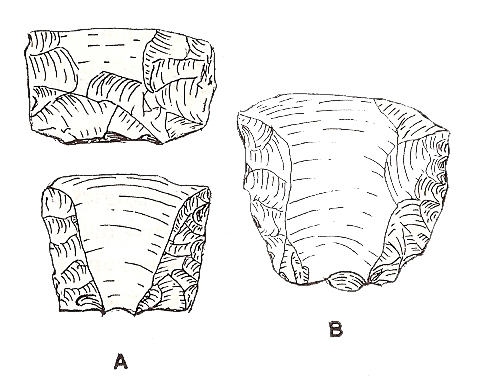 The Walter Site is identified as a temporary campsite belonging to the Paleo-Indian/Clovis tradition based upon the distinctive fluted points, endscrapers, and cores. Artifacts discovered on the surface of the site were not all exclusively related to the Clovis Culture. 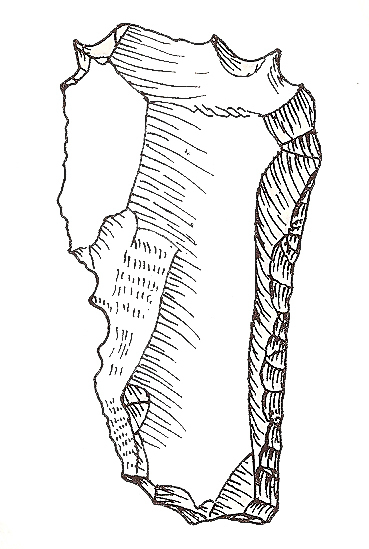 A corner-notched point and contracting stem point would belong to the Archaic and Woodland Periods. 1970 The Walter Site - a fluted point manifestation in North Central Missouri. Memoir of the Missouri Archaeological Society 8: 11 - 63. Special thanks to Ettus Hiatt for her help with text and content editing.